The controversy with the Wakf is a nationalistic issue, but there is also an halakhic issue on which rabbis disagree. The late Chief Rabbi Goren tried to arrange a mass prayer on the Mount in 1967 and was stopped by the government. 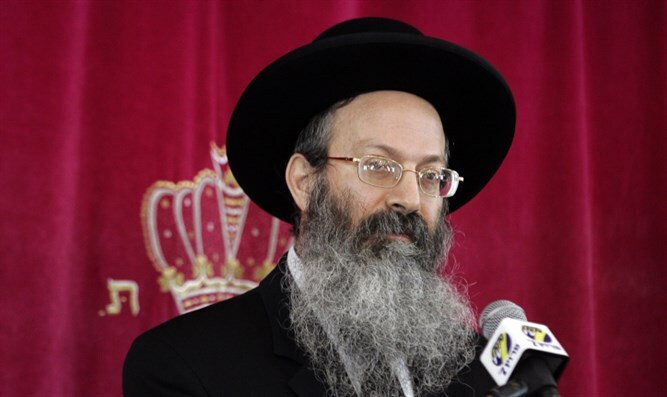 The yahrzeit of late Ashkenazic Chief Rabbi of Israel Rav Shlomo Goren's is this week. Next week on the 24th day of the Jewish month Mar Cheshvan (Monday) will be twenty years since the death of the Chief Rabbi of Israel, the Gaon, Rabbi Shlomo Goren ztz’l. In these days, when Har Habayit (the Temple Mount) is in the headlines, it is worth quoting segments from his book "Har Habayit", published a year before his death. In his book, he investigates in detail the site of the Mikdash (Holy Temple) and the azarot (Temple courtyards), areas that are forbidden to enter even after immersion in a mikveh (a bath used for the purpose of ritual immersion in Judaism), and areas that Jews are permitted to enter after immersion. The time was the days of the second Rabin government, which conducted agreements with the PLO terrorist organization, and handed over parts of the Land of Israel to our enemies. In his introduction to the book he wrote: "Currently, when Jewish sovereignty over the Temple Mount is in danger, Mount Moriah is liable to become the subject of negotiation between us and the Arabs, and unfortunately, there are politicians who are willing to negotiate our sovereignty over the Temple Mount, relying on the alleged prohibition of the Chief Rabbinate to enter Har Habayit. This prohibition is liable to be used as an excuse to hand over the nation's Kodesh ha’Kodashim (inner sanctum) to the Muslims. Therefore, I decided to publish the book now, from which it will be proven that there are large areas of the Temple Mount which all Jews are permitted to enter, according to all halakhic opinions, after immersion in a mikveh..."(p.15). The Temple Mount is composed of two areas. The first, which is the smallest area, includes the site of the Holy Temple and the courtyards, and is called machaneh shechina (the inner azara), which nowadays is forbidden to enter because we cannot be cleansed from tumat met (defilement of the dead). The second area, which includes the majority of the Temple Mount, is called machaneh levia, and it is permitted to enter these areas today after immersion. Indeed, in the years preceding the establishment of the State of Israel the rabbis, including Rabbi Kook ztz’l, instructed us not to enter the Temple Mount at all, for fear that people might go beyond the permitted areas and enter forbidden places. Three factors prompted Rabbi Goren to permit going up to the majority of areas on the Temple Mount: 1) the precise mapping of the Temple Mount conducted by the I.D.F. Engineer Corps under his orders after the liberation of the Temple Mount; with these maps, it was possible to accurately determine which areas were permitted to enter according to all halakhic opinions. 2) The many testimonies that for more than a thousand years after the destruction of the Holy Temple, Gedolei Yisrael (eminent rabbis) used to pray on the Temple Mount in the permitted areas. 3) The threat to Jewish sovereignty on the Temple Mount. It is possible that one of the motivations for placing the warning signs not to enter the Temple Mount might have been so as not to provoke the Muslims when the British ruled Israel, and in events of riots, did not properly protect the Jews. Rabbi Goren wrote about his feelings after the Six Day War: "I could not escape the feeling that from a historic perspective, assigning the Western Wall plaza for Jewish prayer was nothing but the result of the expulsion of the Jews from the Temple Mount by the Crusaders and Muslims together. Thus, an intolerable situation was created in which even after our liberation of the Temple Mount, the Muslims remained on top of Har Habayit, and we were down below; they were inside, and we were outside. The prayers at the Western Wall are a symbol of destruction and exile, and not of liberation and redemption, because Jewish prayers at the Western Wall began only in the sixteenth century – before that, Jews prayed for centuries on the Temple Mount... only about three hundred years ago, the Jews began praying at the Western Wall. And this is the proof: in every reference in the Midrash where it is mentioned that the shechina (Divine Presence) has not moved from the Western Wall, and learns this from the verse in Shir Hashirim (Song of Songs): ‘Behold! There he stands behind our wall’ – this refers to the western wall of the azara, or the wall of the heichal, in other words, the wall of the Kodesh HaKodashim, and not the wall of the Har Habayit, which we call the Western Wall"(pg. 26). However, the intensity of the minhag (custom) based on over three centuries was considerable, and therefore after the Six Day War, the public at large thronged to the Western Wall to pray. Rabbi Goren himself wrote that one of the things that prevented him from acting quickly to regulate the ascent of Jews to the Temple Mount was his being "bound by the ‘chains of love’ for the remnant of our Holy Temple, the Western Wall, where I used to pray every Shabbat, holiday, and Rosh Chodesh evenings. Since my first visit to the Western Wall (as a child), my love and emotional affinity for the Wailing Wall has not faded... ","but our shout ...Who may ascend the mountain of the Lord”... aroused him to become stronger and clarify the heter to ascend Har Habayit (pg. 14). Consequently, he began organizing prayers on the Temple Mount (ibid, pg. 27). Before the Shabbat following Tisha B’Av in 1967, Rabbi Goren publicly announced a mass, gala prayer to be held on the Temple Mount in the areas where entrance was permitted after immersion. However, by the orders of Prime Minister and Defense Minister the prayer was canceled. A few days later, the ministerial committee decided that the Defense Minister and the Chief of Staff order the Chief Rabbi of the I.D.F., Rabbi Goren, not to arrange any more prayers on the Temple Mount (pg. 29-30). The order shocked Rabbi Goren, and he tried everything within his power to cancel it, including writing a long and detailed letter to the ministerial committee, in which he argued: How is it possible that precisely in the holiest place for Jews, it is forbidden for them to pray?! True, there are a limited amount of areas in which entrance is forbidden according to the Torah for Jews and Gentiles alike, but entrance to the majority of the Temple Mount is permitted. Towards the end of his letter, he called out: "Distinguished men! Save the Holy of Holies of the Jewish nation; do not hand over the Temple Mount to those who defile it ..." (pp 30-33). Unfortunately, Rabbi Goren's call went unanswered. Defense Minister Moshe Dayan decided to transfer the responsibility for managing the Temple Mount arrangements to the Waqf, and ordered the Military Rabbinate to evacuate Har Habayit, and not to interfere in matters concerning the Temple Mount any more. Rabbi Goren responded with "rage and sorrow”, informing the Defense Minister that "this, God forbid, could lead to the destruction of the Third Temple, for the key to our sovereignty over Judea, Samaria and Gaza is the Temple Mount" (page 34). Nevertheless, the Defense Minister implemented one of the most shameful acts in the history of Israel, and handed over the affairs of the Temple Mount to the Muslim Waqf. For many years it was known that Moshe Dayan had both a dark and a light side jumbled together. On the one hand, he was a Jewish military hero, but on the other hand, an adulterer and a thief. Apparently, his adultery and thievery tipped the scales against him. That is when he began to lose his public status. His name will go down in infamy. Still, when the Muslims closed the Mughrabi Gate to prevent Jews from entering the Temple Mount, at the request of Rabbi Goren, the I.D.F. broke through the gate to ensure free entry for Jews, thereby expressing sovereignty over the Temple Mount. However, this act did not change the order prohibiting Jewish prayer on the Temple Mount. Rabbi Goren goes on to relate: "Whenever I warned about handing over of the Holy of Holies of the Jewish nation to the Waqf, the response of consecutive Prime Ministers was: ‘Look, in any case the Chief Rabbinate forbids Jews from ascending the Temple Mount, and we are prohibited from praying there." As a result, he decided to write the book and explain the ways, places, and conditions under which it is permitted to enter the Temple Mount (pg. 35). Consequently "we must utilize to the fullest all sides of the heter, so we can demonstrate continuous Jewish presence there, and maintain Jewish sovereignty over the Mount, like the apple of our eye" (pg. 46). It has been claimed that during his tenure as Chief Rabbi, Rabbi Goren agreed to the prohibition of entering the Temple Mount, but this is not true. In the introduction to his book, he wrote: "During my tenure as Chief Rabbi of Israel, I brought a proposal to the Council of the Chief Rabbinate to remove the signs banning entrance to the Temple Mount as determined by the previous Chief Rabbis. Because there were a few members on the Council who had signed on the ban at the time, they requested delaying the decision to remove the signs prohibiting going up to Har Habayit until after I published the book ..." For various reasons, the books’ publication was delayed, and the signs remained in place, "which, in effect, led to the handing over of Har Habayit to the Muslim Waqf" (ibid pg. 35). Moreover, he wrote: "This shameful situation, where under Israeli rule a Jew does not have the right to pray on the mountain of God, cannot be tolerated under any circumstances. The debate over where it is permitted according to Jewish law to go on the Temple Mount, or where it is forbidden, has nothing to do with the government ... These sacred places are not the private property of the Muslim Waqf, whose members have always been a source of bitterness and poison for the Jews, with their incitement from within the mosques on the Temple Mount to slaughter the Jews... had they closed the Temple Mount to Jews and non-Jews alike, I would have kept quiet, but to allow the Arabs to do there as they please while Jews are forbidden to even open up a Book of Psalms and pour out their hearts before the Creator of the world – this is a religious, historical, and legal scandal – nothing short of blasphemy! "(pg. 41). He further added (pg. 42) that by abstaining from going up to the Temple Mount, the Torah prohibition of ‘lo techonem’ (‘nor be gracious to them’), which may also be rendered ‘do not allow them to settle on the soil’ (Avoda Zara 20a) is transgressed, seeing as the poskim (Jewish law arbiters) have already established that the loss of sovereignty is similar to destruction (B.Y. and M.A., O.C. 561:1). Thus, when the government forbids Jews to go up freely, it destroys the place of our Holy Temple yet again. Our teacher and guide, Rabbi Tzvi Yehudah HaKohen Kook, agreed with the poskim who prohibited going up to Har Habayit. But in my humble opinion, it seems that had he known that the over-cautiousness of going up to Har Habayit would result in the loss of sovereignty and turning the Temple Mount into a focal point of hatred against Israel – he would have agreed with Rabbi Goren that it is permitted and a mitzvah to go up. In addition, in my humble opinion, he would have trusted Rabbi Goren’s halakhic inquiries in regards to the areas permitted to enter. The continuation of the disgraceful situation on the Temple Mount brings our enemies hope, and motivates them to kill and riot throughout the country. In order to suppress the wave of terrorism and incitement from its roots, the government and the police must assert Israeli sovereignty over the Temple Mount in the most decisive manner. Blessed are those who go up to Har Habayit, but only if that is done according to halakha. Thanks to them, our sovereignty over the Temple Mount and all of the Land of Israel becomes clearer, and precisely as a result of this, we will merit security and peace.